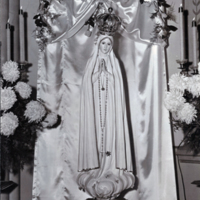 A statue of Our Lady of Lourdes in a shrine in the garden at Rich Street. 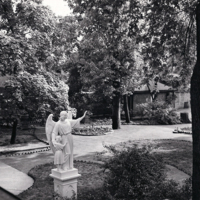 A statue of an angel and child in the courtyard at Rich Street. 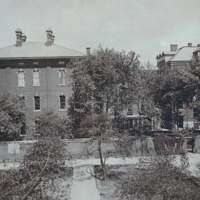 A view of the side of the chapel and part of the convent added in 1898. 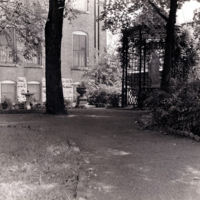 A view of the shrine and statue of Our Lady of Lourdes in the garden at Rich Street under some trees. 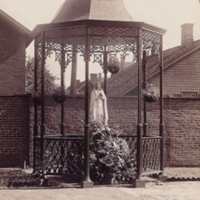 The shrine was built in 1892 and was a frequent place of prayer. 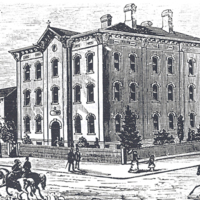 A sketch of the Rich Street convent and the original St Joseph Academy. 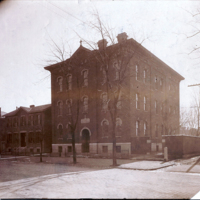 The Academy was built in 1875, when the tuition for higher grades was $8 per quarter and for lower grades $7 per quarter. 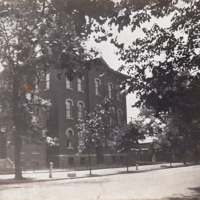 A view from the sidewalk of the academy and convent in 1905. 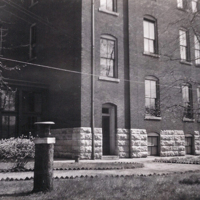 1905 marked the 50th anniversary of the Sisters' presence in Columbus, and was also the year that the first German language class was offered at the academy. 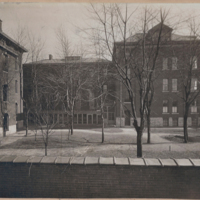 A view of the academy and convent from the sidewalk across from Rich Street. 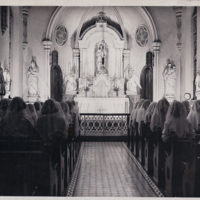 Sisters at prayer in the chapel. 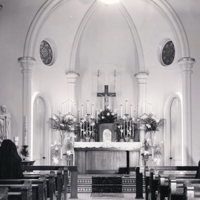 A view of the convent chapel most likely before 1889. 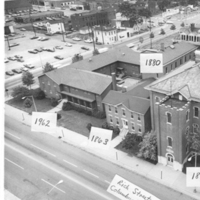 It is believed that this is the appearance of the chapel building that was constructed in 1880 before the extensive renovation in 1889. 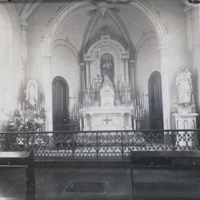 A view of the convent chapel most likely after renovations done in 1889. 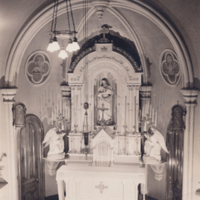 A view of the altar at the convent chapel after renovations done in 1906. 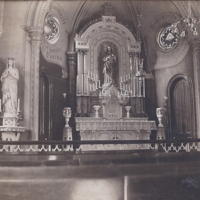 The two angel candelabra were a gift from a graduate of St Joseph Academy and her mother given in 1918. First Communicants praying in the convent chapel. 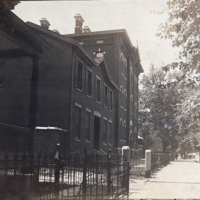 The Annals from Rich Street note that in 1898, a four year old student received First Communion, causing great joy at the convent. 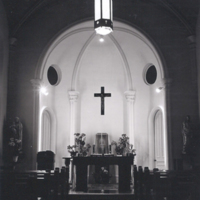 The front of the convent chapel showing the altar, statues, and crucifix. 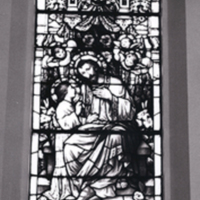 The stained glass window depicting St Joseph was gifted by the Alumnae Association in honor of Sister Josephine Ignatius, former Superior at St Joseph Academy, who died in 1922. 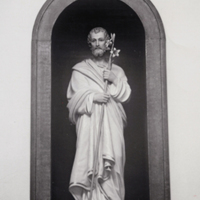 A statue that was gifted by the Class of 1933.